If you are looking for a quick but delish dessert you have come to the right place. 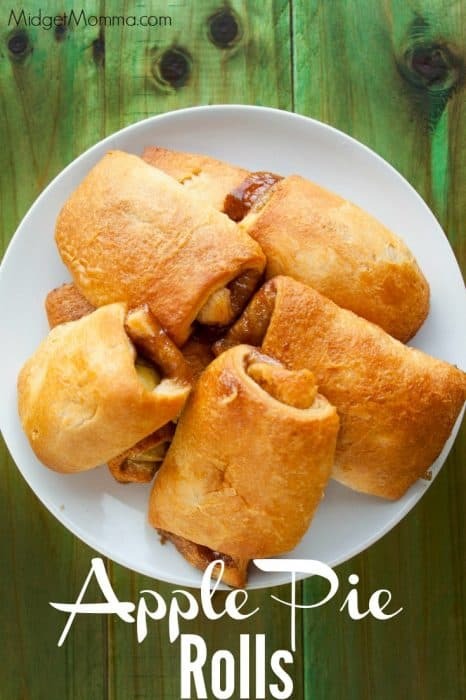 I was able to throw these apple pie rolls together in less than 20 minutes start to finish! When you have spent all day making a big dinner the last thing you want to think about is making some fancy dessert. The great thing is your guest will not even know how simple it was to make these. It is that great buttery flavor you get from a pie crust rolled up and sold as a dinner roll. Now you want to make sure you buy the uncut sheet of crescent dough, not the kind that is already cut into triangles. If your store only sells the precut version that you just have to gently press the cuts together to form a sheet. If you are looking for easy clean up just lay down a sheet of parchment paper because they will leak some of they sugar mixture out. If you love Apple Pie then you need to check out these AMAZING Apple Pie spin off recipes! In a small mixing bowl combine the brown sugar, pumpkin pie spice, and butter together. Roll out the sheet of crescent dough. With a pizza cutter cut the dough in half lengthwise. Then cut the dough into quarters width-wise. Coat the top of the dough with the sugar mixture. Place an apple slice on each section of the dough. 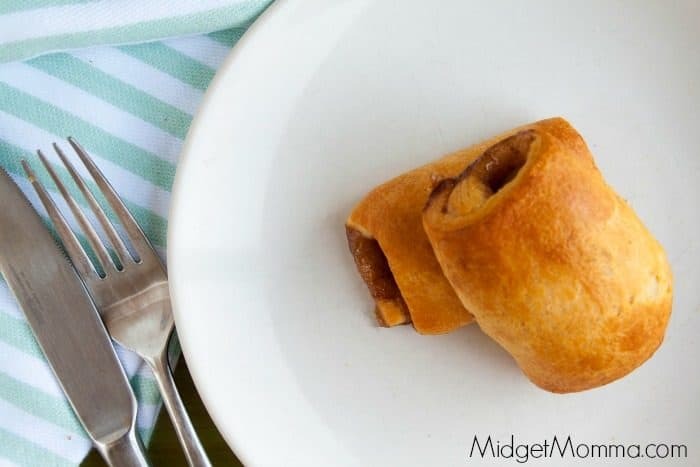 Roll the dough around each apple to form a little pocket for each apple. Place onto a sheet pan. Bake for 10-13 minutes until golden brown. THANK You for your Military Service Lauren! I am a US Navy Veteran; probably served before you were born: 1969-1972 + 2 years Active Reserves. My husband is a US Air Force veteran as well. Thank you for your posts with great bargains but also a kind touch with sharing your ideas, recipes and enthusiasm.